Using data collection to personalize marketing efforts online and… in store! In our class this week, I had the opportunity to analyze an article from A List Apart on Content Strategy for Personalized Websites. 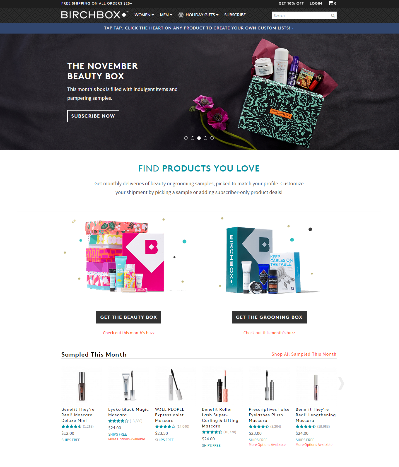 It immediately made me think of how online beauty subscription e-commerce site Birchbox is not only using website analytics to personalize their online offerings, but their physical store promotions are well. 59% of online shoppers say it is easier to find interesting products on personalized e-commerce stores, and 45% are more likely to shop on a store that offers personalized recommendations. Let’s see how Birchbox is handling this opportunity. Here is where Birchbox is the most innovative, in my opinion. Aside from web and mobile traffic, Google Analytics uses tracking codes to acquire behavioral data from physical points of sale as well. The Measurement Protocol add information coming from other digital devices, like information kiosks or tablets located in-store. Birchbox opened its first store in New York City last year, and according to its co-founders, it won’t be so much a venue for additional retail sales as a treasure trove of consumer insight. Both the iPads throughout the store, which recommend products, and the Product Matchmaker, which offers customized suggestions based on a person’s features such as hair texture and skin type, will track what in-store shoppers, in aggregate, click on, and try to determine how that influences purchase behavior. 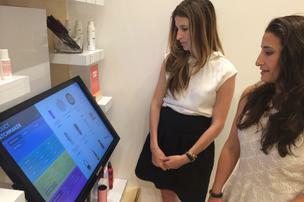 Birchbox Cofounders Katia Beauchamp (left) and Hayley Barna experiment with their product-recommendation software (Source: BizJournal). Birchbox is using cameras and heat sensors to track customers as they make their way around the store, seeing which products they’re attracted to and how they use the iPads. The idea is also to add WiFi analytics and integrate the Birchbox app to the store. When connected to WiFi, the app would be enabled to send push advertisements and collect customer data, like how many times the user has visited Birchbox and what products they have purchased. Do you think this shopping experience is innovating and useful, or rather creepy? Would you rather have customized suggestions of what to buy or be left alone at the store? Tell me what you think about Birchbox’s personalization strategy in the comments! An ethnic subculture is a self-perpetuating group of consumers who share common cultural or generic ties, where both its members and others recognize it as a distinct category. Inspired by the discussion we had in class this week, I would like to talk about McDonald’s ad “First Customer”, which is clearly targeted at the Hispanic minority in the US. The McDonald’s ad successfully target Hispanics in the United States because it doesn’t solely translates to Spanish the same commercial they targeted to other cultures. It shows a situation that seems to be common to families of other ethnicities (as the non-Hispanic manager makes it clear) but localizing it and making it special to Hispanics. The use of Hispanic slang/words, the mix of English and Spanish words in the ad (which is exactly like Hispanic families in the United States speak), and parents representing really well the “Hispanic family way of acting towards their children” make this ad very relevant to this subculture. It makes good business sense to cater to these segments by (literally) speaking their language when promoting ads and services and this ad was successful on that. McDonald’s as a company is known to heavily advertise to ethnic and racial minorities. According to McDonald’s US Chief Marketing Officer, “the ethnic consumer tends to set trends, so they help set the tone for the marketplace”. All criticisms aside, with this ad, McDonald’s wants to be seen as a good work environment for teenagers looking for their first job, and a good food option to Hispanic families. Are Google and Facebook really free? “’Don’t be evil.’” Googlers generally apply those words to how we serve our users. But “Don’t be evil” is much more than that. Yes, it’s about providing our users unbiased access to information, focusing on their needs and giving them the best products and services that we can. But it’s also about doing the right thing more generally – following the law, acting honorably and treating each other with respect”. This is the first paragraph of Google’s code of conduct. While many people who use Google on a day to day basis don’t bother to read the whole code, the motto is widely spread in the company. Google owns most of the applications we use on the Internet daily (such as the top-ranked search portal and widely popular email service and traffic monitoring, just to name a few), and offers mostly free services in exchange for our private data. This acquired data is what powers the most successful ad network, and what keeps Google in business. Because Google knows its audience so well, they can offer carefully tailored ads to customers that are actually interested in them. For investors, Google “generates revenue primarily by delivering relevant, cost-effective online advertising”. The AdWords and AdSense programs are Google’s main revenue source: around 90% of Google’s revenue comes from advertising. Google is not only a search engine with 75% of market share; it is also a very successful advertising company. Now, giving Google so much information about ourselves is what enables them to offer exactly what we are looking to buy or use. That is the price we pay for using Google products. Google promises to “not be evil”, and use this information specifically for what they list on product’s privacy and security policies. However, we can’t help but wonder if they are really not “being evil” with our information. Maybe even more than Google, Facebook is another company that have access to a high amount of personal information. Once a while we see status updates from our friends not granting to Facebook the right to use our personal information, but they certainly forgot that they already agreed to share their data with the social media giant once they signed up to create their profiles. One in seven people in the world is connected to Facebook. Every day, thousands of Facebook users are subjects of social research, without even realizing it. Researchers from various areas such as social sciences, psychology and neuroscience use Facebook data to understand aspects of human behavior. While the usual sample size for some of these researchers in the offline world is of about 20 people, the sample size that Facebook made possible for these scientists to analyze is from thousands, sometimes millions, from different backgrounds and locations. These companies have made our lives a lot easier, and today, it is almost impossible to live without using what they provide. I am not only not concerned about sharing data with them, I’m also thankful for all the services they can offer free of charge, and with state of the art platforms that are reliable and trustworthy. I appreciate when my information is used for purposes of offering relevant information (Google) or connecting people (Facebook). To me, the biggest problem starts when my information is not used for the purposes stated in privacy policies, for instance when our personal data ends up on the hands of hackers. Think about how many interactions you have every day that involve information exchange: credit and debit cards, passwords all over the web, smartphone apps that require you to register with your social media profile and requires permission to access your feed or friends information, maps on your phone and so on. Not to mention “offline” ways to acquire information, such as loyalty cards at the grocery store, or even medical information once you own a health insurance plan. These days, every single company available owns some piece of information about ourselves, and even the most careful about their data security can find roadblocks when trying to preserve their privacy. While these companies have a compromise with their customers to keep their data private, not always they succeed. Companies such as Target, Home Depot and eBay suffered with recent data breaches, which leaked personal information from hundreds of thousands (sometimes even millions) of customers to the hands of hackers. Do you agree with sharing your personal information in exchange for free services that you use every day, just like Google or Facebook? Would you rather pay for those services and not have them keep your personal information? How do you keep your personal data safe from hackers? Share your opinion in the comments!